0430h. Saturday 4th august 2012. I am joining my Muslim friends today, fasting for Ramadan and will join them to break the fast around 9pm this evening. , so I need to make the most of it. I have no religion. I was brought up as a Christian, but became an Atheist in my twenties and then in my thirties I went on a spirtual journey. I explored all kinds of faiths, but never really found a religion that I felt comfortable with. I have my own deeply personal beliefs, part of which is that religion should be personal and not be discussed or debated just lived. 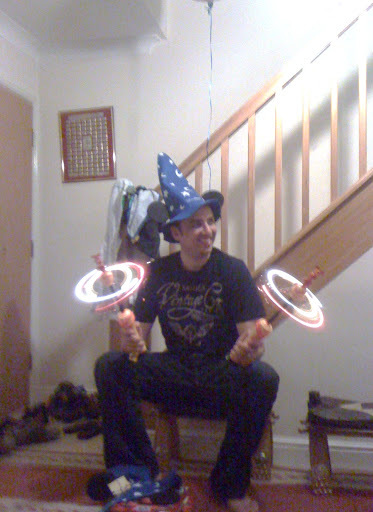 So, in the spirit of unity and respect I wanted to join my Muslim friends, in part of the fast of Ramadan or Sawm. The fourth of Islams five pillars. Which commemorates the month in which Allah(God) , first revealed the Qur’an ( holy book)to Mohammed. Hopefully I will get some spiritual and physical self purification Not only must I fast but also refrain from sexual activity, gossiping, arguing envy and angry words. I also should try to do charitable deeds. So as I see a white light coming across the horizon in the east, the day dawns and I go back to bed. I am awaken from my lovely ,warm,slumber by the text noise on my phone, from a friend asking for the name of a website for skyride. I try not to be irritated (avoid angry words) or text her back with “first rule of text and phone etiquette ,no non urgent texts or calls between 9am and 9pm!” I resist the urge to ignore the text and roll over back to sleep and text her the website “skyride” ….can you call this a charitable deed? 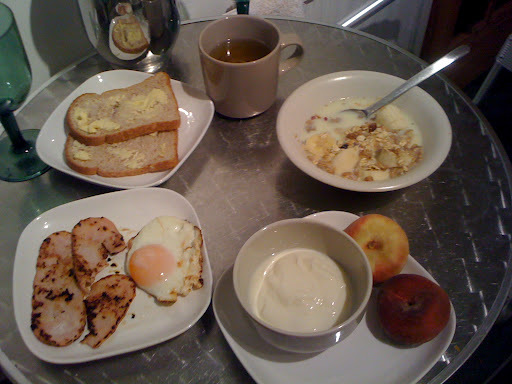 However , I am now awake and as I lie here I realise that a cup of tea and breakfast is my usual incentive to get up. But I can’t go back to sleep and get up anyway. It seems strange not to immediately go and put the kettle on. I know,….get in the shower instead. I am starting to feel a little hungry now and could murder a drink. I feel energy levels getting a bit low. So far it has not been so difficult. In the shower I was tempted to take in some water, but I said the little prayer above and it helps. I try to find things to distract me, so the positive effect is that I keep busy. I took my bike into the shop for repair and walked two miles back. Normally Saturday is my cooking day, LOL! but that would be torture, so I am having a cleaning day in preparation for the visit of my son and family next week. Muslims are supposed to read the Qur’an during Ramadan, but instead I have read and learned lots about Islam today. 13.15h is the time for the next prayer. Dhuhr…. So will meditate. The low energy level, and the inability to think clearly is the most difficult thing to cope with, . which is making me a bit irritable, so not arguing and no angry words, especially when certain people are taking about cups of tea to wind you up!….. I seem to have lost my sense of humour. I can see where the self discipline comes in! although I think the point is that Allah helps you through. I am beginning to get a slight headache. So I am going to go for a sleep. Eventually you get to a point where you have come so far, you are not going to give up now. The point of n return I suppose. I didn’t realise how much I enjoy food, how much I eat food by habit and especially how much I have a cup of tea by habit. How many of my routine activities are automatically accompanied by a brew or a piece of fruit or biscuit.. I have also learned that a simple genuine prayer for strength can often get you through a difficult situation and I have learned to smile and bite my tongue when I feel irritable! One and a half hours to go and I am about to leave soon to go to my friends house in Manchester to break the fast. Thank you so much to my friend Yara, her husband Yousef who are from Sudan and their friends Mohammed and Saima from Egypt. I have never experienced such hospitality, they welcomed me to their home and made me feel at home. I feel SO privelidged to be allowed to share with them. 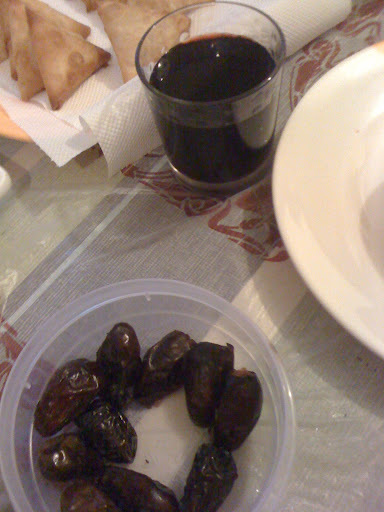 At 2104, we broke the fast the traditional way with dates and a drink like Vimto, a very sugary fruit drink. Strangely by this time I no longer felt hungry and had overcome the fatigue of the middle of day. My friends told me about Ramadan in the middle east, where everything slows down during the holy month of Ramadan, because they seem to spend a lot of time sleeping during the heat of the day. The days are shorter in summer, than in England, sunset coming in the early evening ,so they said I had done very well to go sixteen and a half hours fasting. Ramadan is much harder here, for them as life goes on as normal and they are expected to work as normal.. Ironically they said that breaking the fast with angry words is more of a threat, than going without food and drink. Yousef had been to a football match and had broken the fast with words there! 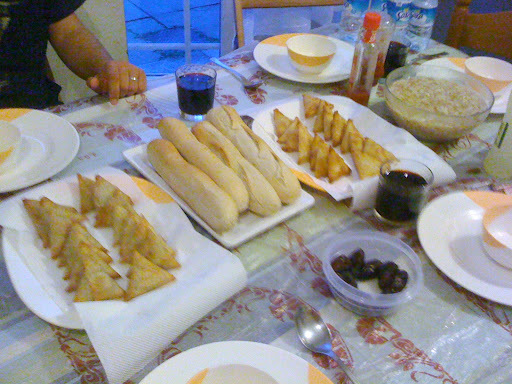 We sat down to start the meal and nibbled at cheese and meat samosas, some potatoe type ball stuffed with meat, falafal, a delicious Egyptian pasta soup, hummus, tabouleh, bread and other bits and pieces.. I thought I would fall on the food and devour it, but I did not fell like doing this and my companions advised me to eat slowly as we chatted. I thought the meal had finished as we went upstairs to pray but when we came downstairs lo and behold there was more food waiting for us. Roasted chickens, a typical Egyptian dish called Kosheri, which is pasta lentils chickpeas and topped with a spicy tomato sauce, fried onions, garlic sauce and other dishes I do not know the name of. Although by this time I felt full, Mohammed advised me to eat or the maid, who had set the meal and done some of the cooking would be offended, so I tucked in and it was delicious. 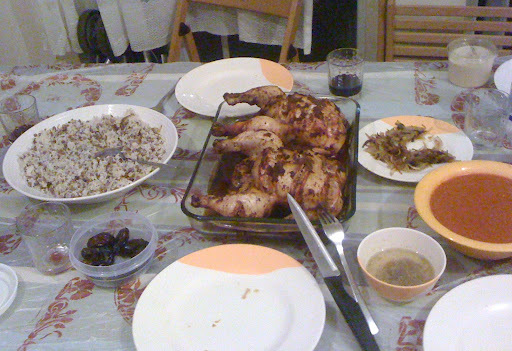 Fara also had spent some of the afternoon cooking most of the food, which I thought must have been torture. I did feel a little nauseated and over full, but, some sparkling water and time settled it. I found room for a bit of delicious apple cake and mint tea. We chatted, laughed and had a good time. We discussed everything for middle eastern political situation in thier countries to Islam and to Mickey mouse as Mohammed had taken the children to a Disney show that afternoon. he had spent a fortune on merchandise, not sure whether it was for the children or himself. We were so engrossed in our conversation and laughter that Fara forgot the time, as she had intended to take me to the mosque for the last prayers. Instead they prayed again in the house. I left around 1am, leaving the men to go out to the local curry mile in Rusholme, and my friend to study, as she has exams soon before they would start the whole process again. Great reading about this, good on you. I didn't think about the fact that, not only do you not eat all day, but you have to stay up late and get up early to do your eating then! I definitely couldn't go all day without drinking or cook a big meal while doing it. You and your friends are much tougher than I am. That food looked delicious though! Well done, Denise! Rather than just trying to understand what it must be like to be a Muslim in England during Ramadan, you really walked in their shoes on Saturday. 16.5 hours is a long time to go without food and even longer to go without something to drink. As Janet said above, I admire your perseverance.One thing that I noticed when we lived in Indonesia is that the people were almost always willing to give food or a bit of money to a poor person. I think that it's because they know what it feels like to be hungry because of fasting during Ramadan. It really does make you more sensitive to people who are not as fortunate.